Description: a dark brown color liquid of a bitter taste. Packed in flasks with 100 ml extract content. Content: Concentrated extract of a mushroom called Chaga - cinder conk (Inonotus obliquus), stabilized in 8.5 % alcohol. Chaga is a type of a conk - a mushroom which grows mainly on birch trees, especially in Russian Siberia. The mushroom is black on surface, brown color in the cut. The fruit body grows up to the size of 30 to 50 cm (15 to 25 inch), weighs 3 kgs and grows up to ten years. It nourishes from the juices of the host. It is collected in fall and spring, when it has the highest concentration of effective substances. The Chaga conk occurs on elm, rowan and ash trees, but based on experience the greatest healing properties has Chaga grown on birch trees. Befungin has a relatively strong anti-cancer effect, while its significant healing effects are especially in the digestive system neoplasm therapy. It is also very effective during treatment of the chronic inflammation of stomach, stomach ulcers, diseases of duodenum, liver and spleen. Befungin is with advantage used during diseases of the lymphatic system and various disorders of circulation of lymph. Because of the connection of the digestive system with skin problems it is an efficient supportive remedy during treatment of psoriasis, eczema, erythroderma and other skin diseases because it improves metabolism on the cell level and therefore increases resistance of the organism. Befungin improves function of the nervous system, put another way "strengthens the nerves and brain". 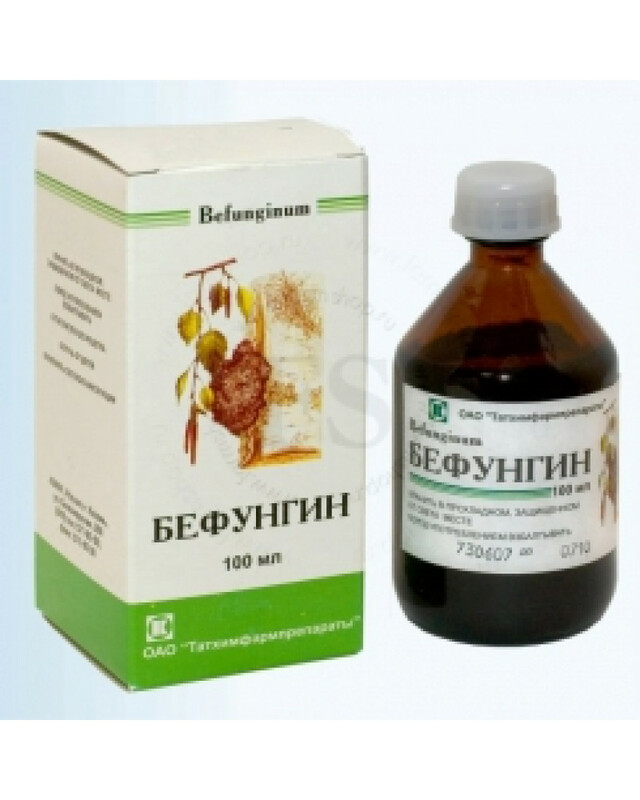 The effect of Befungin is complex and therefore it is not necessary to combine it with other herbs. The main share of the beneficial influence of Befungin has melanin which has a similar molecular structure as the natural melanin of the human body and therefore it has the possibility to penetrate the cell structure without any obstacles and therefore be beneficial in this way. The best effect was achieved during the initial stages of oncological diseases. During the advanced stages it may stop growth of new neoplasms, relieve pain and improve the overall condition of the patient. During the application of Befungin it is very convenient to stop eating meat and fat eatables, tins, smoked meat. The experience of the Russian medicine of many centuries gave an impuls for scientific research of Chaga during the treatment of neoplasms. The extensive basic as well as applied pharmacological research of Chaga concluded in various centers in Russia since the thirties of the 20th century up to present has proven the long experience of the folk medicine. It has been proven that the Chaga extract is an efficient therapeutic and was therefore introduced into the official Russian medicine practise under the name Befungin. This mushroom is indeed legendary. Chaga has been used in Russia as a renowned healing remedy. The famous prince Vladimir Monomach used Chaga to treat lips cancer which he suffered from. As an effective anti-cancerous remedy is Chaga introduced into the official Russian list of remedies in 1858. 3. Take a flask of Befungin, shake it well, open it and pour 3 teaspoons of Befungin into the prepared water. Stir it. 4. Use 1 large spoon of prepared solution (Befungin+warm water) 2-3 times a day 20 minutes before meal. 5. Anytime the mixture is already used up, clean the glass container, rinse it and prepare again a new solution for usage. Continue until the you use up the whole flask of Befungin. Use for the period of 3 - 5 months. If you are repeating the cure have a 7 - 10 days break. Take 30 minutes prior eating. Accumulation of the sediment is acceptable, shake before using. During minor inflammatory diseases Befungin is taken usually only several days. During a supportive therapy of inflammatory diseases, immunodeficiency conditions and tissue neoplasms ("cancer") and hemoblastosis ("blood cancer") a long-term use is necessary, in some cases 3 - 6 months or even longer. After a 3 month use of Befungin a 7-14 days break is recommended.